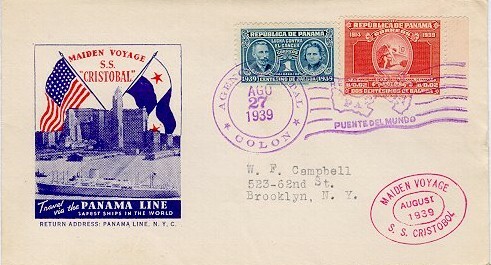 The S.S. Cristobal was requisitioned from the Panama Railroad Company by the U.S. Army on January 11, 1942. Twelve days later -- her trim lines muddled with camouflage paint, and partially converted so every valuable inch could be utilized -- the Cristobal sailed from New York with troops and supplies. Destination: New Caledonia. However, political relations between the Free French, the Vichy French and the United States were not yet clear, so the convoy with which the Cristobal was traveling was diverted to Australia. There the ship reloaded, picked up field artillery guns and proceeded to New Caledonia. Arriving at Noumea, New Caledonia, the first part of March, 1942, the troops disembarked by using the ship's lifeboats. For days, these troops sweated over the unfamiliar and back-breaking job of handling all cargo by hand. There were no facilities ashore at New Caledonia. Our war was three months old. The Cristobal was next ordered back to New York. As she drew near the Atlantic Coast, there was no rest for the officers and crew. The coastal waters were known to be infested with enemy submarines. None was spotted until the Cristobal was off Cape Hatteras. There the dark dripping snout of an emerging sub was sighted. She hulked out of the water as the men on the Cristobal waited tensely. The men on the submarine were evidently just as amazed at finding an enemy ship so close by, and the submarine submerged. Back in New York the Cristobal was further converted to carry 2,300 troops. She next headed for Belfast, Ireland. Then, on to Scotland for British troops, and to join a convoy of British and American ships. On Memorial Day, 1942, the Cristobal sailed fur Suez. The long voyage, via Freetown, West Africa ... Capetown ... Durban, South Africa ... and Aden, Arabia was made safely, and the Cristobal, reached Suez July 23, 1942. Once there, her days seemed numbered, for she was exposed nightly to fierce air attack, particularly from the ships' deadly enemy, the torpedo plane. However, the Cristobal's luck held, and the gallant ship started the long trip home unscathed. On this trip, her "passengers" were Italian prisoners of war bound for Durban. And this time she sailed alone. thirty-one days later the men on the Cristobal, thankfully eased the ship into New York Harbor, having stopped a day in Durban, while the Italian prisoners disembarked, and a day in Capetown to pick up fuel oil. At the end of October, 1942, the Cristobal left New York again -- destination unknown. She was headed for the invasion of Casablanca. In the space of eleven days the Cristobal was filled with wounded service men at Casablanca ... 1,300 of them ... who were brought back to New York. For the duration of the war in Europe, the Cristobal made trips back and forth to the Mediterranean, North Africa and Italy with occasional trips to England and Iceland. After the invasion of Normandy, she landed troops at Utah Beach and later at Le Havre, Marseilles and Port Said, the Mediterranean entrance of the Suez Canal. When the European conflict was ended, the Cristobal, brought back troops from Italy, France and England. She carried a great many sick and wounded being particularly well fitted for use as a hospital ship. In January, 1946, the ship underwent another partial conversion -- this time for the comfort of the bride and diaper trade. The Cristobal carried a vast number of war brides and children from England, France, and Port Said without a single casualty. By the time she made her last war-service voyage, the stately Cristobal was quite used to the maze of didies and dainties hanging everywhere. On her last trip she carried American dependents to Bremerhaven, Germany, and returned with war brides from France and England. After completing 4 years and 5 months service with the army, the S.S. Cristobal was gratefully returned to the Panama Line. Today she is once more proudly sailing in luxurious peacetime dress. All that remains of her wartime service is the ship's log. January 11, 1942 - June 14, 1946, and the memories of the men who sailed the S.S. Cristobal.